It would happen every single weekend. I’d sit down to sketch out our family’s meals for the week…and drive myself crazy deciding what to make. Didn’t we just have that last week? What’s something good I can make in the slow cooker since I’m out all day Monday? That’s too many chicken dishes in a row, what’s good that’s vegetarian? It was taking almost as long to come up with the menu as it did to shop for the groceries. I realized that my brain was overloaded with too many options. I was trying to choose from a field of all possible meal ideas in the world for what to make for dinner and was quickly getting overwhelmed. That’s when I realized I needed a shortlist of maybe just 20 or 30 go-to dishes, the ones our family has enjoyed the most. I took ten minutes one morning and brainstormed ideas in categories such as “Poultry”, “Pasta”, “Seafood” and “Slow Cooker”. Oh yes, this was an Excel exercise for sure (remember, I’m Type A). Now I just choose from the list…problem solved. Of course, I still try out new recipes too. This Japanese Pork Cutlets recipe from the side of a bottle of tonkatsu sauce went straight onto the shortlist under “Pork” once we tried it this week. Anything with a crisp, golden panko crust usually gets my vote. 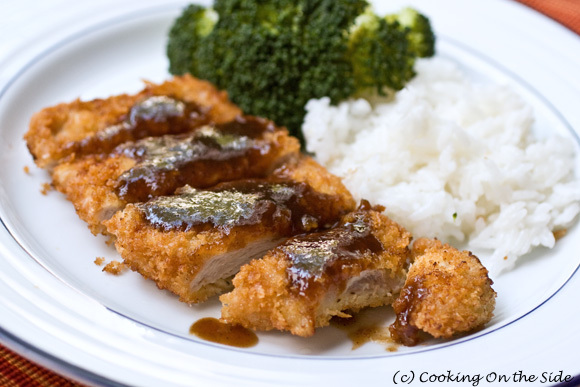 The sweet and tangy katsu sauce is terrific with the savory pork. All I needed were some steamed rice and vegetables to get this new go-to meal on the table in less than 30 minutes. 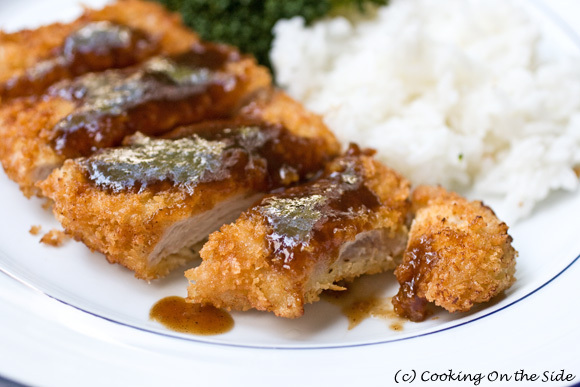 Adapted from the Pork Cutlets recipe on the side of the Kikkoman Katsu Sauce bottle. Pound each pork chop to 1/4-inch thickness. Coat the pork chops with flour, then dip into the egg and finally coat thoroughly with panko. Deep-fry in 1 inch of vegetable oil, heated to 350°F, 3 minutes on each side, or until golden brown. Serve with katsu sauce over steamed rice. Great idea, especially now that school is going to be session! I used to do this but stopped for some reason – I’ll have to get organized once again, I know it will make shopping a lot easier! I’m impressed by your menu planning! I’ve always wanted to try this dish and it looks so delicious here. I’d love to see your short list of meal ideas! 🙂 I struggle with this too… only I’m horrible – I don’t plan my meals – I just make what seems to be on my mind at the time … and I waste too much food! That looks delicious and I love tonkatsu sauce! I made this with chicken instead of pork. Very good!